It certainly doesn’t look like a national border – a forgotten, slightly gloomy pedestrianised backstreet, seeming of use only as a shortcut to more significant places. A little stream shrugs its way under a small bridge, heading nowhere at any great speed; the ground on either side debates the shades between brown and green. On one side of the stream is the back end of a supermarket; on the other, a row of slightly run-down garages, with a brick-red church spire poking up behind. A steady trickle of pedestrians heads in both directions. Really, the only clues to alert you to the fact that we’re at a frontier are a miniature wooden sentry box, seemingly abandoned, and two stubby zebra-striped posts by the stream, each bearing coats of arms. 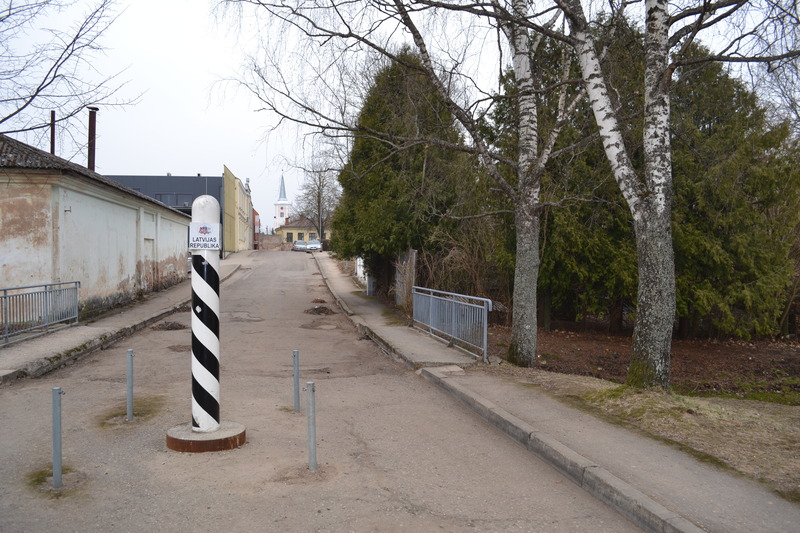 These posts are now all that separate the very similar-sounding towns of Valga, Estonia and Valka, Latvia. If you went back a hundred years ago, the scene you would find would not be significantly different, but you would not find this border, nor the names Valga or Valka. What you would find would be Walk, a prosperous, confident provincial market town and important railway terminal, benefiting from its strategically important position where lines between Tallinn, Riga, St. Petersburg and Pskov met. Walk was pronounced with an initial “v” sound, because, like almost all the towns in modern-day Estonia and Latvia, it was named by Germans, who had been the land-owning class in this part of the world since the 13th century. The Baltic Germans never formed more than 10% of the population, but acted, in effect, as caretakers for the many foreign powers who battled over the region – the Poles, Swedes and finally, the Russians – keeping order in return for the preservation of their privileges. The Estonians and Latvians, the indigenous people of the region, formed the overwhelming majority of the population but were predominantly rural and largely impoverished, unable to improve their social status without a deliberate act of self-Germanification or Russification. For many hundreds of years, despite being united by common languages, they also lacked a national identity – if you asked an Estonian peasant what nationality they were, they would simply answer “ma olen maalane” (I am a country person). That started to change in the late 19th century as Estonian and Latvian intellectual classes developed and dedicated themselves to forming the peasants and farmers into nations. The nationalists’ chance finally came in 1917, with the Russian Revolution; the ensuing chaos and instability left the Russian state unable to maintain order in its more tangential provinces, and both Estonia and Latvia declared independence. The two new countries helped each other in the ensuing, extraordinarily complicated struggle against both the Red Army and various forces of state-sanctioned and adventurer Germans – indeed, it was the Estonians who liberated Riga in 1918 – but problems developed once the countries’ independence were definitively secured in 1919. Northern Latvia and southern Estonia had been governed together under the Russian Empire as “the Livonian Governorate”, but there seemed to be a fairly clear line through the region where towns suddenly switched from majority-Estonian to majority-Latvian, and all happily peeled off into their new homes. The exception was Walk, a significant railway junction and a city where everyone was a minority. Who did it belong to now the Russians and Germans were out of the picture? It was too important to both the Estonians and Latvians for either to willingly give it up, even to an ally. Alarmed, at the prospect of a new war in the region, the nascent League of Nations sent Sir Stephen Tallents, a British diplomat, to find a reasonable solution. After spending some time in the city, Tallents came up with an answer, although it wasn’t one that particularly satisfied anyone, apart from lovers of cartographical quirks: he ordered for the city to be chopped in half, following the small stream that runs through the city centre. In fact, the stream doesn’t neatly slice the town into two equal parts: it meanders through the city, giving a wide berth to the actual centre. As a result, Estonia got a significantly better deal, winning the railway station – the reason why the town was of a respectable size anyway – as well as the lion’s share of the city centre and most of the local industry. This meant that the new Latvian town of Valka was a bit of a scraggy, strange thing – with the rear end of the city centre, a park and a number of residential houses. This is why Latvians still say that their crafty northern neighbours deliberately got the Englishman drunk before he submitted his decision. Following Tallents’ verdict, a border was hurriedly thrown up between the two sections of Walk, and suddenly townspeople needed their passports and documents to go to the end of their road – not to mention a different currency. Pictures from the time show incongruous scenes, with customs posts squeezed uncomfortably between semi-detached houses. All this was wiped out by the Soviet occupation; now again, residents of Valga and Valka had the same government, administrative system and currency. Under the occupation, the two towns were still in different constituent republics – the Estonian Soviet Socialist Republic and the Latvian Soviet Socialist Republic, but since the autonomy of the different constituent republics were theoretical more than real, this made little difference to everyday life and the physical marks of the separation were rubbed out. The fences and border checks popped back up again when both countries declared the restoration of their independence in 1990, and only came down when Estonia and Latvia joined the Schengen Zone in 2007, following their accession to the EU three years earlier. Even without these borders, crossing the stream – not incidentally, a raging torrent or majestic river: you can step over it –from Valga to Valka remains a profoundly odd experience. A sign welcomes you to Latvia, and the Latvian flag with its blood-red stripes is hung outside a house immediately in front, just about as far as it can go before representing a territorial claim. Other changes, however, are more subtle: the road signs change from electric-blue to moss-green, and become a good deal harder to read; Estonian chains are replaced by Latvian ones; and the radios inside are tuned to Riga stations, broadcasting from 120 miles south. Most obviously, everyone is suddenly speaking a completely different language – and the difference is very considerable: Estonian is an unearthly, chirruping language unrelated to any other European tongue bar Finnish and Hungarian; Latvian is a slow, full, Baltic tongue spoken mostly from the back of the mouth, and meticulously annotated in writing with numerous diacritical cedillas and lines. The whole thing makes you want to doubt at least one of your senses. That’s not to say that there aren’t people who have a foot in both camp; while speaking to an assistant in the tourist information office in Valga, I am surprised to suddenly notice on her nametag alongside the Union Jack and the Russian tricolour, not only the austere blue-black-white of Estonia, but Latvia’s scarlet-and-white combination. Asked how it is that she speaks all four of the city’s working languages, she says that her mother is Latvian and father is Estonian; she has always lived in Valga, but went to school in Valka. Does she still often make it over to the Latvian side to see her friends there? She looks slightly wistful and says “I would like to, but there just isn’t time to go there”. Nadezhda, the headteacher of Valka’s only primary school, tells me that this situation is not unusual: around ten families living on the Estonian side send their children to school in Valka, although in all cases at least one of the parents is Latvian. She’s not a native of Valka, having moved from the nearby town of Smiltene in 1979, but seems to identify closely with the town now. She seems to view its division as almost a personal affront: when, talking about the pre-Schengen town, she says “bija muita” (there was a customs point) she suddenly hushes her voice, putting on a shocked tone, as though relating some kind of grotesque injury. It certainly was inconvenient – she tells me of long queues at the border, administrative complications, and so on. She mentions that this had a lot to do with why people in the town were so supportive of EU accession – and she’s right, in the 2003 referendum on membership, Valkans voted heavily in favour – the ‘yes’ vote was higher than all but one other town in Latvia. The line drawn up by Stephen Tallents in 1919 has remained respected by all subsequent administrations, however arbitrary it may have originally been, with the consequence that Valga is still considerably larger than its Latvian twin. People in both towns are still dealing with the strange everyday consequences of Tallents’ ruling, and this is particularly palpable at Valka district council, in a modern, moderate-sized building about a ten-minute walk from the Estonian border. One of the council workers tells me about how the division of the town can, potentially, have life-threatening consequences. There is a hospital in Valga, but not in Valka, and so if a Latvian citizen needs medical treatment, but is too seriously injured to hobble across to the Estonian side, the ambulance is legally obliged to drive them to the nearest Latvian hospital – in the city of Valmiera, around 30 miles away. The situation has improved recently, as the mayors of the two conjoined towns have forged a close relationship – “they are best friends”, she tells me. The mayor of Valka, Vents Armands Krauklis, is a large, genial man – and, oddly, was once a clarinettist with one of Latvia’s most popular – and politically active – easy-listening groups – who seems to view the strange set of problems he’s confronted with as leader of half a town with wry good humour. He confirms that relations with the Estonians are good, and getting stronger, but his attitude towards the national government in Riga seems primarily one of frustration, due to their apparent inability to see that Valka is in a unique situation, and although in a different country from Valga, is inextricably tied to it. It’s only recently that an agreement was reached between Riga and Tallinn to permit firefighters from each of the twin towns to lend help if they see a house burning on the other side of the border. Prior to this, even if it was burning a foot over the border, putting Latvian houses at risk, legal restrictions would proscribe them from intervening. Asked if he speaks Estonian at all, Krauklis, he says that the answer is basically no, but that he always says a few words at pan-Walk events; as his counterpart, Kalev Härk, does in Latvian. I find a video of this online later, and it seems to be a showstopper. Admittedly, learning the language of the folks down the road was never a priority – Latvian has a million and a half native speakers; Estonian less than a million, and at least during the Soviet period, everyone on either side of the border was forced to learn Russian at school, creating a lingua franca where there had been none before. Krauklis tells me, however, that while growing up in Valka during the ‘70s, he did know a lot of Estonians, the result of a strange, cruel, bureaucratic quirk of the sort the Soviet Union specialised in. Among both countries’ greatest traumas remains the deportation of around 3% of their total population to inhospitable regions of Siberia and Central Asia in a series of swoops in 1941, 1946 and 1949, targeted because they were wealthy farmers, nationalists or simply in the wrong place at the wrong time. By the late ‘50s, most had been allowed to return, but those considered to be the toughest or most dangerous to national security were generally not permitted to live in their home soviet republic. Naturally, a number of those banned from Estonia moved to Valka, where they could wander into the forbidden territory every day of the week if they pleased, stare at it at the other end of the street; the same was true in reverse of Latvians settling in Valga. In the perfectly square park outside the city council building is a statue of one of Latvia’s most important and controversial figures, Kārlis Ulmanis, a bulky, pugnacious character resembling a bequiffed badger. Ulmanis seized power in a coup in 1934, citing threats from both Communism and the quasi-Fascist Pērkons movement. For the next five years democracy was suspended, some rights were restricted and a cult of personality developed. The same thing had happened in almost exactly the same way a month earlier across the border, as Konstantin Päts used fear of the growing Vaps movement, a group of radical anti-Communist war veterans, to install himself as unquestioned leader. Both Päts and Ulmanis died in exile in Russia, having been exiled after the Soviet occupation. This must have been a particularly strange place to experience both coups, watching from across the dividing stream as men with guns appeared at street corners and urgent proclamations in foreign tongues were pasted up on walls. A short walk away is a graveyard, dappled in the spring sunlight, which marks the furthest extent of Latvian territory. The gravestones mostly commemorate Latvian owners, given away by their obligatory “s” suffixes, with terse German or chewy Russian ones occasionally interspersed between. I don’t spot any Estonian names. At the edge is some twig-scattered in-between land, a little sinuous stream and some wood-and-brick houses maybe a couple of hundred feet away. In between, there’s a little stumpy post, so innocuous as to be barely noticeable. With that, Miera iela shifts to Piiri tänav, and I walk along the road in the sun, observing the spaced-out houses, somehow both ramshackle and neat. The border posts are strung along the side of the stream at intervals of about 100 ft, not quite able to mark the precise border, but straining to do so as much as possible without getting wet. This stretch of the border is the one that has been subject to many of the most inconvenient peculiarities. A website created seemingly for the purpose of recording these pre-Schengen eccentricities boasts entries like the following: “this building was erected about 1981 when both towns were united by the Soviet Union. On this picture the building is watched from southern side. The Estonian border guards walking patrols along the border have here actually to step over on Latvian territory for about 5 meters to get around the property”. Others tell of families living in the same house subject to separate jurisdictions and granted special passes to avoid the most strenuous aspects of the bureaucracy. One entry patiently explains that, due to an oddity in the placement of one particular border post, the cable attached to the wall of a Valga garage (but not the wall itself) is in Latvian territory. Back in Valga, I head for the city council, about a ten-minute walk away, where I have a meeting with Kalev Härk, Krauklis’s Estonian counterpart. As he welcomes me into his office at Valga City Council, he gestures with a slight grimace at a map covering the far wall: it’s of Valga, but is tightly cut as though it were a normal town; Valka is pushed to the periphery or off the map entirely. “I want to change it” he tells me, before offering me a photocopied paper map about the size of an envelope, zoomed out considerably, which features a single, uncut town trimmed with countryside. Once again, people seem to be trying to present Valga and Valka as a single town, only with the significant challenge of incorporating a national border into this image of unity. Kalev mentions old pre-EU maps, even worse than that on the wall, which represented anything south of Sõpruse and Piiri tänav, where Valga runs out, as white space – “no life”, he says, chuckling. I notice a solitary pin on his lapel, displaying crossed blue-black-white and scarlet-white-scarlet flags. I mention that Vents mentioned that the two mayors have not only built a strong professional relationship, but are also good friends, and a fond smile crosses Kalev’s face. He seems to share Vents’s frustrations with the government – only in his case, it’s with those in power in Tallinn, around 150 miles north. He mentions as a particular grievance that taxes from the significant number of Valkans who take advantage of the higher wages in Estonia go entirely to the national government, since they are classed as foreign workers – rather than, as is the case for locals, the majority going to the local administration. However, he is principally positive about the situation that faces him – Valga has long been one of the poorest towns in Estonia, something surely not unrelated to the artificial barriers put up with its twin, but due to the increased co-operation between the two councils, it finds itself in the odd position of being in rather a sweet spot for businesses. Taxes, as well as general bureaucratic requirements, are a little lower in Estonia, while Latvia has, on average, lower salaries. There’s no reason for businesses wanting to base themselves in the area not to have it both ways – low Estonian taxes, cheap Latvian workers. Finally, its strange division may bring some benefits to the city. Kalev bids me farewell with “thank you for your interest in Valga-Valka”, which is normally how he refers to the town, in a mellifluous rhyme. Valga/Valka is in noticeably better shape than when I first visited, almost three years ago. Then, on a moody November day, it seemed a decidedly gloomy place – the principal impression I took away was rain-soaked wooden houses, glum Soviet boulevards. Now, those rotting buildings, which looked one creak away from collapse, have had a coat of paint visited on them. The railway station, in particular, which is the end of the line for both the Estonian and Latvian national companies, was decrepit and half-painted a shade of drained-out green; it seemed a gasp of exhaustion given physical form. Now, scrubbed-up and adorned with Valga’s slogan “üks linn, kaks riigid” (one city, two states), it seems at least welcoming, rather than a warning to go no further. Another significant change bringing the two closer together relates to the streamlining of currencies – when I first visited, Estonia had joined the eurozone, but Latvia was still using its former currency, the lats, which further intensified the city’s air of slightly mundane insanity. At the start of last year, Latvia also adopted the euro, meaning that exchange rates are no longer a concern for Valkans taking advantage of Valga’s wider range of products. Other changes are more gradual – Walk’s erstwhile lingua franca, Russian, is rapidly losing ground. With the collapse of the Soviet Union, studying Russian at school immediately went from top-priority to non-compulsory; now, all over the Baltic states, knowledge of Russian among young people is dropping, and the rate is particularly precipitous outside of the large cities. Nadezhda, herself an ethnic Russian, albeit one who speaks excellent Latvian, admits that although her students have lessons in Russian, when they speak to their friends in Valga, it is now English that is used. This sliced-up town is a testament to the complexity and difficulty of Baltic history – the way there are no easy answers; although increasingly and worryingly, Estonia and Latvia’s mutual neighbour seems eager to place question marks over the admittedly strange state of co-operation that has descended upon Valga/Valka. Russia has rehabilitated the Molotov-Ribbentrop Pact, the secret agreement between the Soviet Union and Nazi Germany that divided up Eastern Europe between them, and led to Valga and Valka being unwillingly reunited. A group of deputies from United Russia, Vladimir Putin’s party, recently described the State Council of the USSR’s 1991 decision to recognise the Baltic States’ unilateral declarations of independence as “discard[ing] a large and strategically important part of the Soviet Union.” Before I start on the three-hour journey north to Tallinn, I wonder, with some trepidation, what the future will bring to these strange towns. If they’re left as they are, odd rhyming complements, they seem to have a good chance of prospering; it doesn’t seem to be 1938 – or 1918 – again, but suddenly no one directly west of Russia can be totally sure of anything. © Deep Baltic 2015. All rights reserved.